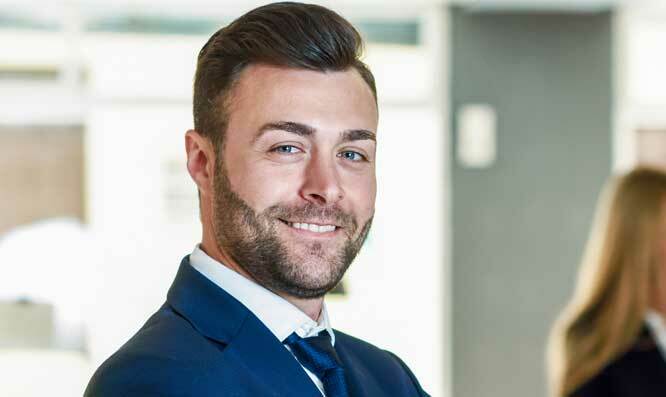 They are not only passionate about the orthodontic industry, they are committed to providing optimum care and delivering compassionate, patient services. We believe that bed-side manner is as important as orthodontic skill. 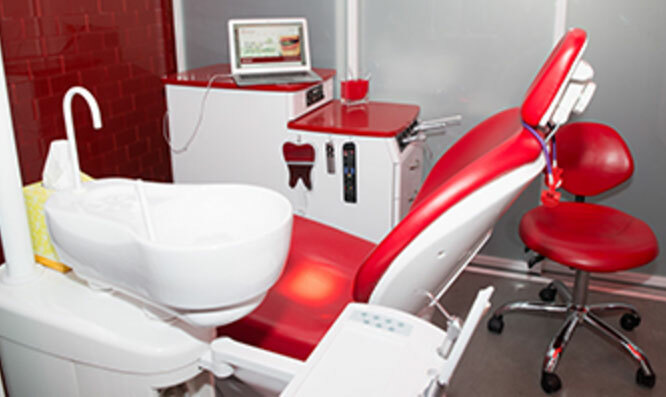 No matter which location you visit, you can count on having a luxurious experience with the latest in dental technology, specifically with the iTero scanner, 3d digital imaging and non-spatter radiation x-ray units. The offices of Dr. Jacquie Smiles are dedicated to continued learning and integration of state-of-the-art technology and new methodology into clinical practice. This ensures that all of our patients receive the best treatment available. AcceleDent Aura is one such treatment technology. It is a new, FDA approved appliance that may help to decrease the time of treatment by up to 50%. This means that treatment that typically lasts two years, may only require one year to provide the same results. We also offer Invisalign as an alternative to traditional braces. Aside from being removable, the clear Invisalign trays are virtually undetectable, making them perfect for working professionals and teens, alike. As being the first female and youngest Director of Boston University Dental School’s Predoctoral Orthodontic Department, Dr. Jacquie felt honored paving the way for women to follow her. She wants to be a beacon of hope for women to not feel intimidated to enter a world that has been for generations heavily influenced by men. Dr. Jacquie says “it is exhilarating to see the initial 15-20% of the dental school classes who were female when she started to being 50% (and some even more) filled with women.” Dr. Jacquie she feels so proud to see the influx of women in her field. In the beginning of her career, Dr. Jacquie was asked to lecture and present her abstract to 1200 orthodontists and their teams in Las Vegas. She presented her abstract of a four-year double blind study on identical twins, comparing one twin being treated with tooth colored ceramic braces and the other with Invisalign. Dr. Jacquie compared the initial and final results, patient comfort level, chair time and overall orthodontic treatment time. As the future goes, paying it forward is what Dr. Jacquie is all about. She created a foundation called the The Dr. Smiles Foundation formed by her and her husband. It focuses on changing the world one smile at a time. It will provide dental services for those in need, focuses on anti-bullying efforts and will also have a Miles for Smiles run included in its 2018 initiatives. Our goal is helping patients feel better about themselves by improving their overall oral health, occlusion and dental esthetics in an environment they feel comfortable being in. To schedule a consultation, please call the office you wish to visit. Meet Jacqueline Fulop-Goodling, D.M.D., P.C. 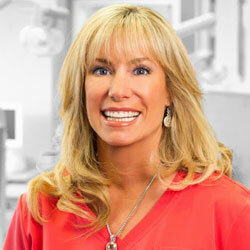 She is a VIP Platinum Invisalign Provider and has been recognized as a top provider every year since 2003. In September 2005, Dr. Jacquie Smiles became Invisalign’s Spokesperson for a hygiene campaign. In 2009, Dr. Jacquie became a Spokesperson for Invisalign Teen treatment which was featured on the Tyra Bank’s show. On the show, Dr. Jacquie discusses the advantages of Invisalign treatment with clear aligners. Dr. Jacquie on the Tyra Banks Show talks about Invisalign. Since then, Dr. Jacquie Smiles presented a four-year double-blind study on identical twins, comparing one twin being treated with braces and the other with Invisalign. As an Invisalign professor, Dr. Jacquie teaches and certifies students and orthodontic residents in many of our dental schools and universities in the U.S. and Canada. She has also taught over 14,000 doctors, students and their teams in multiple areas of orthodontics throughout the world including North and South America, Europe, Asia, The Caribbean and the Middle East. Dr. Jacquie’s mission is to brighten the world one smile at a time. She achieves this through educating her patients and creating her signature broad smile design. Dr. Jacquie says, “What I do with my patients is the perfect balance between science and art.” She explains to her patients the science behind what is occurring throughout their treatment, while still showing the beauty of the individual in each case she creates. When Dr. Jacquie is not busy being an orthodontist or creating multiple dental related patents, she is giving back the community. She’s been part of Jorge Posada’s former craniosynostosis awareness foundation, autism awareness and the Stephen Siller Tunnel to Towers run. Annually, Dr. Jacquie attends and participates in the Tunnel to Towers run through the Brooklyn Battery Tunnel which is an event commemorating a firefighter Stephen Siller who laid down his life to save others on September 11th and other heroes we lost that day. It helps build homes for wounded vets that fight for us and allow us to do what we love; for Dr. Jacquie that is creating beautiful smiles. Bernadette, a.k.a. 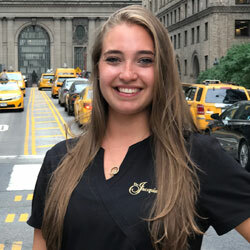 Bern, has been part of our Dr. Jacquie Smiles team since she was 8 years old, initially as a patient in our Woodbury, Long Island practice, and now as one of our hygienists, getting her hygiene degree at NYU. 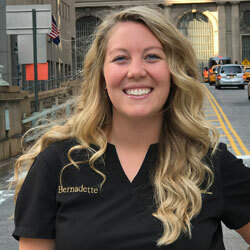 Bern says, “Since I was a kid getting braces with Dr Jacquie, I have been wanting to be a part of the dental field. I love educating patients in and out of the office about bettering their dental hygiene routines with simple, quick and efficient techniques.” In her pastime, you can find her biking at SoulCycle or living at the beach. 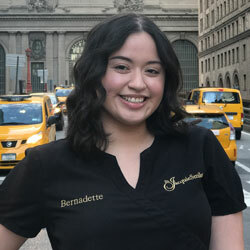 Blanca is one of our friendly & most worldly hygienists in our NYC office. She has been working in the dental field for 17 years and during her cleanings, Blanca says she constantly talks to her patients about everything under the sun from oral health care and flossing to traveling the world. Blanca says, “I enjoy people and I am an avid traveler and have been all over the globe. I love NYC’s diversity and it’s amazing the different truths patients have when it comes to brushing and keeping their teeth clean. Many patients don’t realize that “natural” bristles or medium or hard bristled toothbrushes damage your teeth and do more harm than good. Please only use “synthetic soft bristles” and I’ll teach you a lot more when you sit in my chair!” :)) In addition, she says that she’s a gym rat and loves how positive it makes her feel after working out and exercising. Brooke is a warm and friendly face who welcomes you to our office as one of our patient coordinators. After getting her bachelor’s degree in early childhood education, Brooke knew that she wanted to go into the nursing and medical field to help people and children. 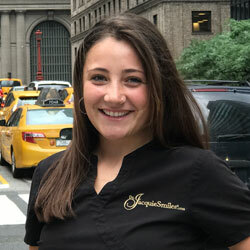 Brooke says, “I have been working in our office for a short time and absolutely love that I decided to pursue a career within the dental field. When I am not working, I enjoy spending most of my time in the kitchen, trying out new recipes as well as baking. Brooke says that autumn is her favorite season because she love being outdoors whether it’s going hiking, camping or even taking rides at an amusement park. 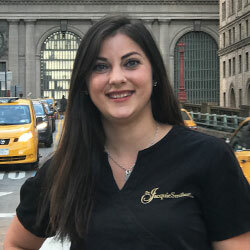 Filomena is one of our dental team leaders and helps the NYC team coordinate and synchronize the office, patient and team schedules. She is a graduate of Briarcliffe College with a degree in business administration. Filomena aids in overseeing the orthodontic and dental treatment plans. Filomena says, “I love working one on one with each patient and guiding them through the doctor’s treatment plan. 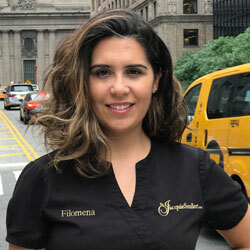 I am here to make the process as seamless as possible because every patient has a different need and dental necessity.” Filomena enjoys traveling with her family and gets her exercise in with hot yoga and long walks with her dog, Niko. 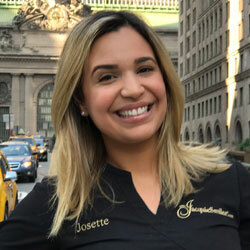 Josette is a familiar face to our patients at our dental health fairs throughout Manhattan, Brooklyn and the Bronx and also, at our NYC office. Josette says, “Educating people about the different aspect of dentistry at our health fairs is a perfect balance for me to introduce our orthodontic and cosmetic dental teams to them. More often than not, people just want to find a good dental home with great care. It’s easy for me because that’s exactly us . . . with the most advanced dental technology!” As our senior clinical coordinator, Josette is responsible for making sure all of the day-to-day operations run smoothly and efficiently. When she’s not working, Josette spends most of her time with her daughter – most oftenly at the movies, shopping or grabbing a bite. Lauren is one of our energetic and friendly senior college year interns interested in going to dental school. Lauren says, “Interning here has definitely confirmed my aspirations of wanting to go into the medical field, especially dentistry and I realized that medicine is much more than just being good at math and science. The team here is very patient focused and has taught me that there is a person attached to every smile and every set of teeth!” In my free time I love spending time with my family and friends; and in addition occasionally getting out on the basketball court and play a quick game of pick up. Marie has been a part of our Dr. Jacquie Smiles family for close to 10 years and initially started out as an assistant, then office manager and now administrator for our offices. As our practice administrator, Marie oversees the day to day operations and is involved in our patients’ overall treatment. Marie is known for her cheerful devotion by our family of patients and has even been known to get back to them during non-business hours. 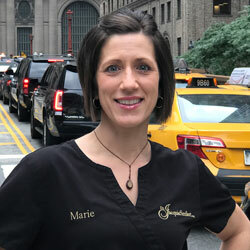 Marie says, “I am a people person and running my own business previously has helped me work closely with each and every patient and personality to help ensure that they could have the best dental experience possible.” Marie & her husband are native New Yorkers, originally from Brooklyn, and moved to Orange County to raise their children. When Marie is not working, she loves spending her free time in Lake George with her husband, children and dog, Candy. Mirna is a bubbly and friendly face who welcomes you to our office as one of our scheduling coordinators. She began her journey in the dental field, after getting her bachelor’s degree from St. Joseph’s College in Brooklyn. Mirna says, “I am excited to be part of a great team and amazing work family. It’s a perfect synergy between my degree and my customer service skills I learned from my previous career at Victoria’s Secret.” In her free time, Mirna likes to spend time with her family and friends. One of her favorite hobbies is dancing and enjoys to watch the different choreographies as she teaches it to herself. Samantha has been part of our Dr Jacquie Smiles family as a former patient, intern and now team member. She joined us to help oversee and supervise all new and existing projects and is responsible for seeing them come to life. Samantha says, “I have almost completed my undergraduate studies at Holy Cross and working with the doctors and patients in our office is so positive that it just reinforces my desire to go to medical or dental school.” In Samantha’s free time, when she is not working or studying, she enjoys dancing and is on her college’s hip-hop team called Fusion. Wendy is part of our clinical team and has a positive infectious energy when it comes to educating patients about their dental health. She has over 9 years of experience in dentistry and gets excited about advancing in the latest dental technology. 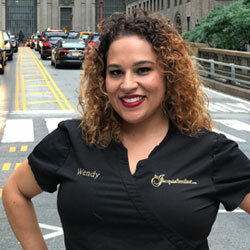 With a big smile, Wendy says, “My favorite part of our clinical team is that we are constantly ahead of the curve when it comes to any advanced or new technology within dentistry. I enjoy educating patients about their complete oral health care and the technology we use here makes it that much easier to show them how to do it.” On her spare time, Wendy enjoys summer outdoor activities and loves to cook for her family friends and especially us. We strive to make each patient feel welcomed and comfortable while straightening and whitening their teeth. Patients can sit next to their friends or spouses and have their treatments done simultaneously or they can have complete privacy in separate luxury rooms. It is a spa influenced office specializing in a clear orthodontic technique known as Invisalign. Invisalign is the latest technique in computerized orthodontics and advanced orthodontic wires are also utilized in all of her offices. This allows her patients to increase the time between their visits from monthly visits to every 2-4 months, while seeing amazing results. All of her offices are equipped with the latest computer imaging systems and radiographic equipment to show her patients their cases along with similar completed ones. At your initial consultation, you are welcomed with a tour of her office and Dr. Fulop-Goodling will conduct a complete evaluation and discuss your concerns and the current treatment options available. At your first visit to Dr. Fulop-Goodling's office, you will be greeted by one of her patient coordinators and be given a tour of her highly equip, state of the art office. Your first visit is approximately 45 minutes long. Digital photographs may be taken to allow you to see your overall teeth alignment and bite in greater detail. Dr. Fulop-Goodling will do a complete orthodontic evaluation and then discuss the different treatment options to satisfy your concerns. The patient treatment coordinator will then review the fees for the proposed treatment you choose. At your second appointment, diagnostic records are made to confirm the recommended treatment. Diagnostic records typically include plaster study models of the teeth, digital x-rays and photos. Digital x-rays mean less radiation exposure to our patients. Dr. Fulop-Goodling will study these records to develop a custom treatment plan for each patient. After your appliances are received, regular appointments take 20 to 40 minutes and are usually every 6 to 12 weeks apart. Upcoming wedding so I decided to get my teeth whitened. Upon doing some research online I found Dr. Jacquie Smiles. I also ended up finding a Groupon. Everything went perfectly. Short wait time, super friendly staff, and great results. I'll definitely be coming back to keep up with my super smile. Front desk is awesome. Friendly and helpful!! Office is centrally located. Their prices make teeth whitening affordable and accessible for the masses. All 4 kids have beautiful smiles! Great, friendly, courteous doctors and staff! Great staff and doctors, Dr. Jacquie made sure everything’s was done right as well as checked up on me during my appointments. I would recommend them to anyone! Loved it!! We have both our daughters going through the process with Dr. Jackie and her team. The results we have seen with their smiles is amazing. We absolutely made the best choice going with Dr. Jackie and her team. From the consult through all of the different phases Dr. Jackie treated our girls like family. Her assistants are always great, friendly and kind. They are patient and explain every step of the process. The office staff put a great financing package together and always go out of their way to work with us. If you need braces don’t go anywhere else. Go to the best to see Dr. Jackie and her team. I have been a patient of Dr. Jacquie’s for a few years already. Dr. Jacquie and her knowledgeable staff couldn’t be any nicer, more accommodating, friendly and reassuring. I have since brought my two daughters for their braces too. I came here for teeth whitening. I bought it from groupon and the result is good. They are friendly and helpful. Dr. Jacquie has been the orthodontist for all 4 of my kids and she has done a wonderful job for all of them. The end result from where they have started has been truly gratifying . She and her staff have always been professional and comforting. Her office is warm and nurturing. I heartily recommend her. My experience at Dr. Jacquie’s has been amazing. The staff always and humble to serve. 5/5 stars! I recommend to anyone in the area. The practice is very clean and organized. The staff was very professional and friendly. Satisfied with my results, will go back. Dr. Jacquie is amazing! Behind her soft spoken casual demeanor is a lightening quick brilliant mind which combined with her technical skills is able to assess a challenge with razor sharp accuracy. Dr Jacquie is the best orthodontist ever! Great staff! Fantastic care. Thank you. I would recommend you to anyone. Whether you are a new orthodontic patient of Dr. Jacquie’s or you are looking to whiten your smile for that special event, we ask that you please print and fill out these patient forms. Get a head start on your appointment with our patient forms. To continue making your dental experience pleasant, we have conveniently provided our dental forms below. You can fill them out in the comfort of your home and bring them into the office with you. Please print and complete the appropriate form below before you come in for your visit. Thank you and we look forward to seeing you in our offices.